A basic principle of ESD control in any manufacturing environment is that ESD susceptible items should only be removed from ESD Protective packaging when they are in an ESD protected area (EPA). Most EPAs are made up of “islands” of control, so the packaging and materials handling system must provide proper protection for ESD susceptible items during transport and storage outside those islands of control. When moving ESD susceptible items outside an EPA, it is necessary for the product to be packaged in closed ESD Shielding packaging. But keep in mind the following points; they’re common bad practices. Do not use a shielding bag as an ESD work surface. Although a shielding bag is safe to use around ESD susceptible products, it is not intended to be a work surface for product and should set aside or discarded after removing the product from the bag. 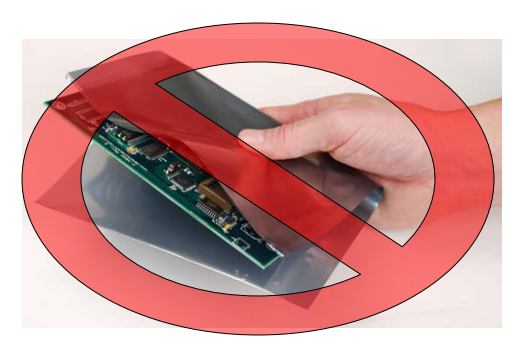 Do not use a shielding bag as an “ESD potholder” or “ESD taco,” by folding the bag over the product to hold it or move it. This type of use offers no ESD protection to the product. Shielding bags must be large enough to enclose the entire product and closed with a label or zipper on that style of bag. Exposed product edges are unacceptable. Metal-in film laminate bags are designed to be used throughout an ESD protected area and grounded when placed on a grounded surface or handled by grounded operator. BUT; place the closed bag on an ESD work surface before removing product to remove any charge that might have accumulated on the surface of the bag. Re‐using shielding bags is acceptable as long as there is no damage to the shielding layer. Bags with holes, tears, or excessive wrinkles should be discarded.